Adrian Resendez started The Resendez Law Firm, PLLC in 2015 as a solo attorney in Austin, Texas. 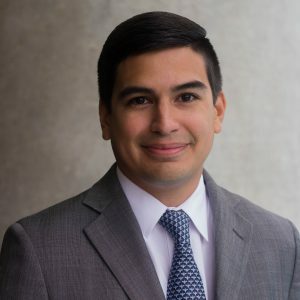 Mr. Resendez has worked for the Texas House of Representatives, several litigation firms, and technology consulting companies. Mr. Resendez attended the University of Texas at Austin on scholarship and graduated in two and a half years with a double major degree. He then attended Texas A&M School of Law focusing on intellectual property, international business, and immigration. Mr. Resendez is a board member for the Lawyer Referral Service of Central Texas, board member for Texas Accountants and Lawyers for the Arts (TALA), treasurer for the Austin Bar Solo/Small Firm section of the Austin Bar Association, board member for the Adderley School (a non-profit providing theater education to underprivileged youth), committee member for the Silicon Labs’ Austin Sunshine Run through the Young Men’s Business League (YMBL), member of the American Bar Association Intellectual Property division, American Immigration Lawyer’s Association (AILA), Hispanic Bar Association of Austin, Austin Young Lawyer’s Association (AYLA), Austin Young Chamber (AYC), and the Greater Austin Hispanic Chamber of Commerce (GAHCC). Mr. Resendez enjoys spending time traveling with his wife, catering to his needy Shiba Inu and Golden Retriever, and exploring all the new restaurants and bars in Austin.